One of the lead stories on the front page of the Daily Beast yesterday was headlined "It’s Not Just Antifa: Now GOP Wants to Lock Up Liberal Women." This immediately confused me, and not just because the awkward phrasing initially made me think Antifa wants to lock up liberal women. I was mostly confused because Daily Beast reporter Kelly Weill is evidently the only reporter who managed to hear multiple Republican leaders call for the incarceration of liberal women. Anti-Brett Kavanaugh protesters are a "mob." They’re "angry leftists," "crazy," and "bullies." That’s according to prominent Republicans, who’ve spent the past month attacking liberal protesters with a zeal previously reserved for anti-fascist demonstrators. Republican Sens. 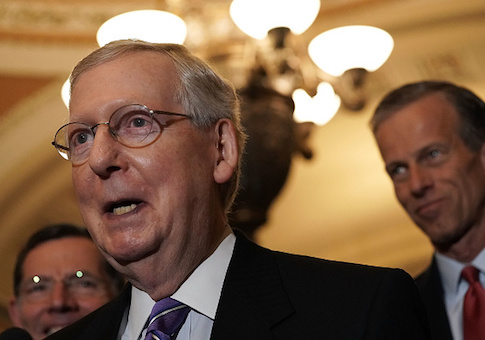 Chuck Grassley, Mitch McConnell, and John Cornyn last week accused protesters of being a "mob." President Donald Trump went further, calling the peaceful demonstrations against his Supreme Court nominee "dangerous," likening them to arsonists and suggesting their protests should be illegal. Those aren’t empty threats: radical left activists have spent the past two years fighting court battles over protests the right also condemned as dangerous mobs. Now that language, and the legal threats that go with it, are coming for the broader left, like the liberal demonstrators on Capitol Hill last week. So setting aside the Trump stuff (more on that later), the first evidence that "GOP Wants to Lock Up Liberal Women" is that senators accused many of the Kavanaugh protesters of being a "mob." C'mon. Is it Weill's stance that the Democratic politicians and media figures who called Republicans "terrorists" were literally calling for their arrest and imprisonment? Or is it more likely that it was a rhetorical exercise, the same of rhetoric you see used in Daily Beast pieces referring to Republican staffers, Michelle Bachmann supporters, and Tea Partiers as a "mob"? Actual quotes are provided later in the piece. Chuck Grassley said Democrats "have encouraged mob rule" and John Cornyn said, "We will not be bullied by the screams of paid protesters and name-calling by the mob." It may not have escaped your notice that in neither of those quotes do the senators say they "Want to Lock Up" anyone. And while it is true that many of the Kavanaugh protesters were women, it's simply deceptive to say the GOP want to lock up "Liberal Women" when none of the Republican senators even alluded to gender and the average reader would take away from the headline that they want to lock up liberal women as a class. Surely editors realized that. Surely they didn't care. Okay, but what about the fact that Trump "[suggested] their protests should be illegal." I'll admit, if true, the Daily Beast wouldn't be too far off the mark. After anti-Kavanaugh demonstrations last month, Trump suggested criminalizing protest altogether. "I don’t know why they don’t take care of a situation like that… I think it’s embarrassing for the country to allow protesters," he said of anti-Kavanaugh protesters in September. "You don’t even know what side the protesters are on. … In the old days, we used to throw them out. Today, I guess they just keep screaming." THE DAILY CALLER: "Have you seen some of it? It’s been a lot of protests and interrupting." POTUS: "I’m amazed that people allow the interruption to continue. You know, there are some people that just keep screaming at the same people. In the old days we used to throw them out. Today I guess they just keep screaming. I thought Sen. Hatch was good because he was very indignant at the interruptions by a woman that was up there that just kept going on and on. I don’t know why they don’t, why they don’t take care of a situation like that because it’s terrible. I think it’s embarrassing for the country to allow protesters, you don’t even know which side the protesters were on. But to allow someone to stand up and scream from the top of their lungs and nobody does anything about it is frankly — I think it’s an embarrassment. Trump's statement should not be remotely controversial, given that the conduct he was describing actually is illegal and 70 people were arrested. Even free speech absolutists don't believe you should have the right to interrupt and shout down government business. To look at the above paragraph and take away that "Trump suggested criminalizing protest altogether" is ludicrous. Of course even if Trump did say he wants to ban protest altogether, that's still not him saying he "Wants to Lock Up Liberal Women," which you may recall was the headline of the piece, a headline that at no point is supported by the actual evidence provided. But hey, I bet people clicked! This entry was posted in Politics and tagged Daily Beast. Bookmark the permalink.